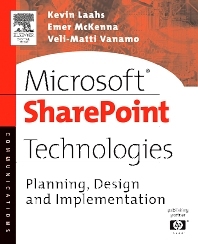 Microsoft SharePoint Technologies: Planning, Design and Implementation provides an in-depth examination of the tasks involved in planning, designing and deploying SharePoint in your enterprise. The book examines SharePoint from the user's perspective, the administrator's perspective, and the application developer's perspective and looks at how you can maximize your investment by integrating SharePoint features with Office 2003 and other enterprise applications in your environment. The authors are experienced consultants that have helped many large corporations deploy Microsoft technologies within their enterprise. This book is filled with practical experience and knowledge gained from working with customers in the field. Kevin Laahs is a senior member of the Technology Leadership Group within HP’s Consulting and Integration practice. He is currently focused on Exchange Server 2003 and SharePoint Portal Server V2 and helps customers determine how such products can assist in solving their business problems. Kevin is a frequent speaker at industry events such as the Microsoft Exchange Conference and TechEd. Kevin is co-author of Microsoft SharePoint Portal Server: Building Knowledge Sharing Applications. Emer McKenna is a member of the Technology Leadership Group within HP’s Consulting and Integration practice. She is focused on assisting customers with the planning, design, implementation and integration of messaging and collaborative technologies into their enterprise. Emer is co-author of Microsoft SharePoint Portal Server: Building Knowledge Sharing Applications. Groove. For the last 2 years he has been the technical architect responsible for the internal HP Consulting and Integration Enterprise Knowledge Management Systems. Veli-Matti is a frequent speaker at industry events such as Microsoft TechEd.